CSIR-Structural Engineering Research Centre (CSIR-SERC), Chennai, India is one of the national laboratories under the Council of Scientific & Industrial Research (CSIR), India. CSIR-Structural Engineering Research Centre (CSIR-SERC), Chennai, India is one of the national laboratories under the Council of Scientific & Industrial Research (CSIR), India. CSIR-SERC has built up excellent facilities and expertise for the analysis, design and testing of structures and structural components. Services of CSIR-SERC are being extensively used by the Central and State Governments and public and private sector undertakings. Scientists of CSIR-SERC serve on many national and international committees and the Centre is recognized at the national and international levels as a leading research institution in the field of structural engineering. CSIR-SERC has been certified as ISO 9001:2008 quality institution. CSIR-SERC acts as a clearing house for the latest available knowledge and develops know-how on design and construction of all types of structures. It undertakes application-oriented research in all aspects of structural engineering – both design and construction, including rehabilitation of structures. It provides design consultancy services, including proof checking, to organizations in the public and private sectors for developing a variety of structural designs. 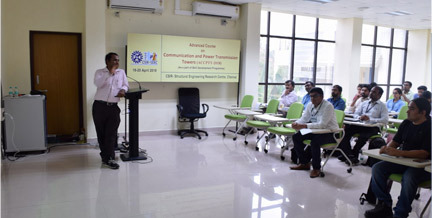 CSIR-SERC also organizes specialized courses on structural engineering for the benefit of practicing engineers to familiarize them with the latest developments in analysis, design and construction. To be a global leader in structural engineering by excelling in research in frontier and cutting edge areas, and by developing competitive technologies by embracing innovative inter- and trans- disciplinary approaches for the benefit of society and industry. To pursue and excel in research in frontier / cutting edge areas of structural engineering and to create niche areas. To emerge as the most preferred resource centre for industry for solving new challenges in structures of different sizes, shapes, geometry and purpose of use. To develop and transfer sustainable technologies addressing societal needs. To be a preferred knowledge centre for providing structural engineering solutions for pre- and post- disaster needs. Development of innovative processes and products. High-end knowledge based service to industry. Services to society and strategic sector.